So, I learned something new today. “Big Eddy” by Leinenkugel’s actually refers to two different beers: a Wee Heavy Scotch Ale, and a Russian Imperial Stout. Well, this review is on the Scotch Ale. Hopefully next winter I can locate the Russian Imperial Stout and give you faithful viewers a look-see at that. Style: Wee Heavy/Scotch Ale. The wort of these beers goes through a long boiling process, which carmelizes the wort, which gives this ale it’s deep brown/copper color. These ales are sweeter and fuller-bodied than Scottish Ales, and have a more pronounced malt flavor. Overall Impression: Yum! Honestly, this was a great beer for a cold and rainy night (even if it is May.) Light enough to drink right before bed but dark enough to be satisfying. Appearance: Dark coppery brown color with minimal head. That may be because this beer was served at a little cooler than ideal temperature, though, so I won’t focus much on that. Aroma: Chocolate, toffee, and caramel. My favorite things. This is the kind of beer that when you smell, you can’t wait to drink it. Taste: Roasted malt flavor with caramel and chocolate notes. Big Eddy Wee Heavy pretty much tastes exactly how it smells. No surprises here. Mouthfeel: Smooth but not too thick. It’s a little too alcoholic (9.5%!) to be a session beer but it is light enough that it won’t put you to sleep right away. Anywho, tonight (this morning? 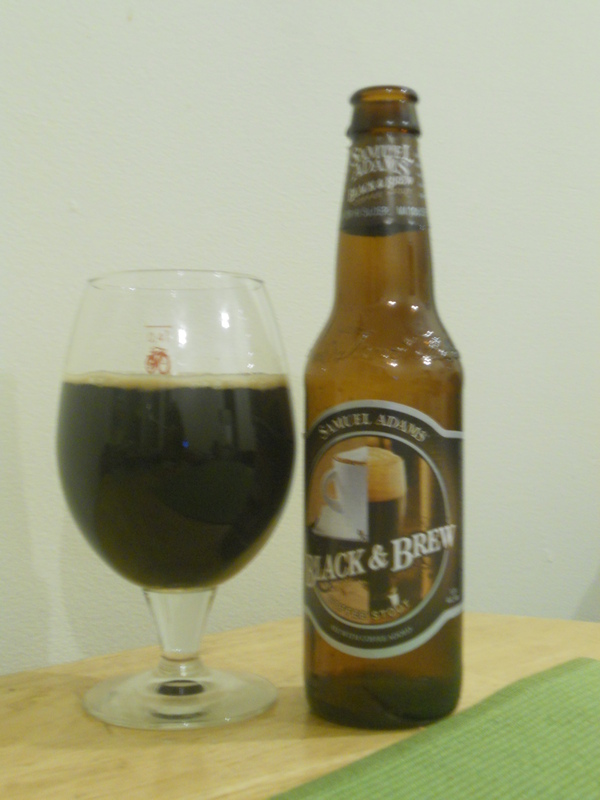 It’s 12:38 am as I write this…) we are reviewing a coffee stout from Samuel Adams: Black and Brew. I don’t really consider Sam Adams to be a “craft” brewery; since they are one of the largest “microbreweries” around. That said, I do like to taste their craft-style concoctions such as this one. I’ve also looked at a few of their other microbrew styles. On to the review. Overall Impression: *thinking to self* “Robin, I can’t wait to drink this!” And I was right to be excited. It’s quite a good example of a coffee stout. Honestly, the only reason this gets a 4-star rating is because it’s a very typical coffee stout. Great beer, but nothing amazing going on. Appearance: Deep, thick black with a creamy head. Aroma: It really smells like the grocery aisle where you can buy coffee beans in bulk. If you like that aisle, try this beer. 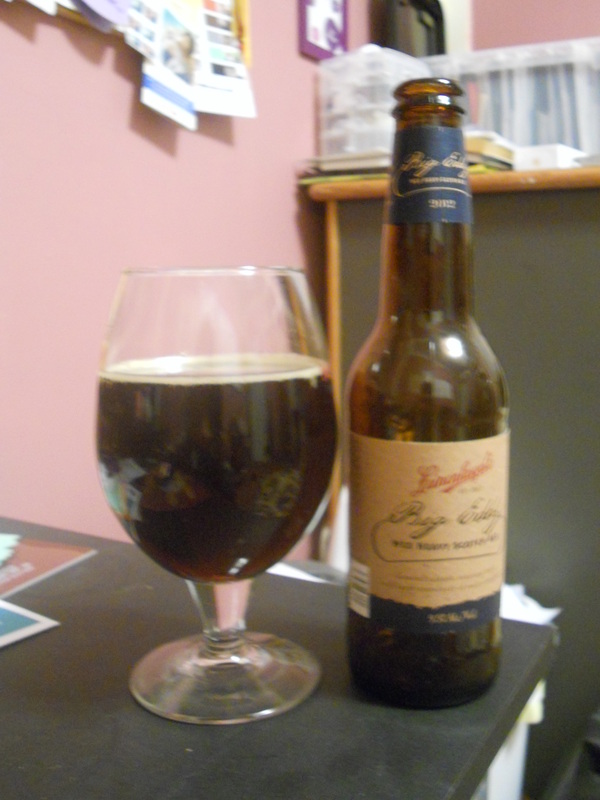 Taste: Deep, rich (but not too rich) coffee/malt taste. Mouthfeel: Smooth but not very creamy with slight carbonation. I know what you’re thinking. Guinness, Robin, really? But hear me out: in 2010 Guinness announced that they were going to start exporting Foreign Extra Stout to the U.S. And I got my hands on some of it. Brewed by St. James Gate in Dublin, Ireland; Guinness is probably one of the most recognizable beer brands. But to be perfectly honest, the standard Extra Stout is really not that good. This one’s different. Guys, this tastes NOTHING like the usual Guinness draught you buy by the four-pack to make Irish Car Bombs with. This is not the Guinness that squeaky girls drink to prove they like “dark” beer. In other words, this ain’t yo momma’s Guinness. Style: Foreign/Export Stout. What this means is one of these beers is brewed like a normal stout except with an exorbitant amount of hops to keep it fresh for the overseas journey. 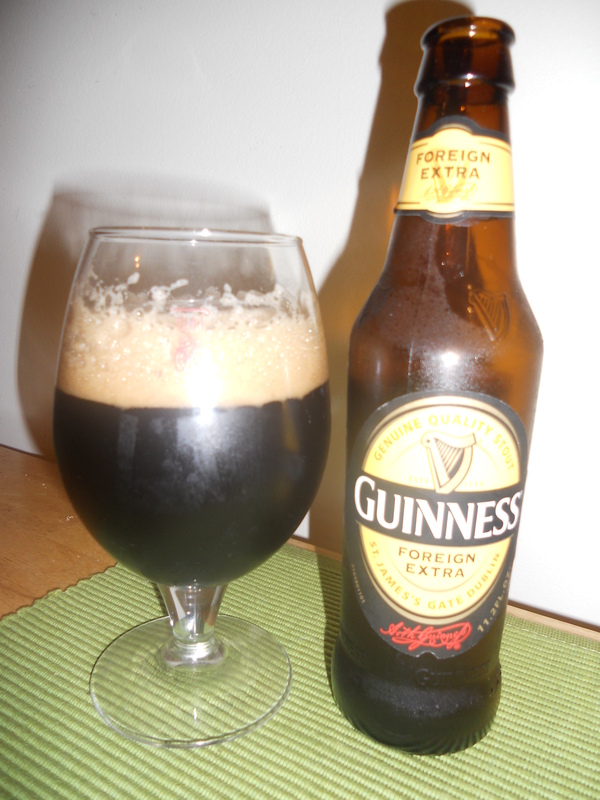 Overall Impression: Mmmmm….THIS is what Guinness should be. Regular old Guinness, you could probably drink buckets of. This stuff, this beer has some body to it! Drink it slow and savor it. Appearance: Lovely black-dark brown color, beautiful head retention. Taste: The bitterness doesn’t really come out until the second sip. At first you get roasted coffee with a hint of cocoa (as one would expect for a stout) , but then the hops hit you hard. And you like it. Mouthfeel: Smooth and fairly creamy. Textbook stout. Hi everyone. I know you missed me. I’ve missed you! I’m almost done with my first quarter of grad school, and I thought now that I’ve finished my homework for the weekend I’d write a few posts. 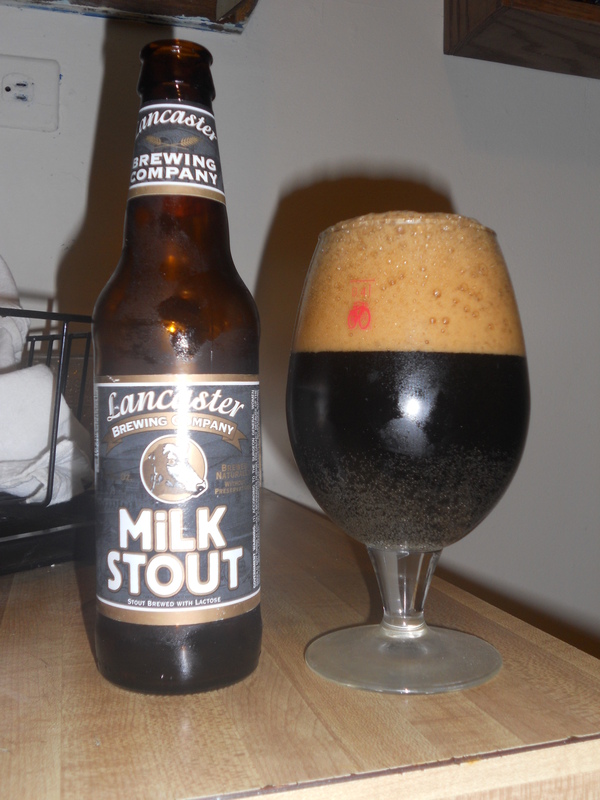 Tonight’s beer is from the Lancaster Brewing Company in (you guessed it) Lancaster, PA. About six weeks ago (which was, admittedly, a bit earlier for a stout) I tried their lovely Milk Stout. Will you just look at the head and color on that? Beautiful. Style: Milk/Sweet Stout. 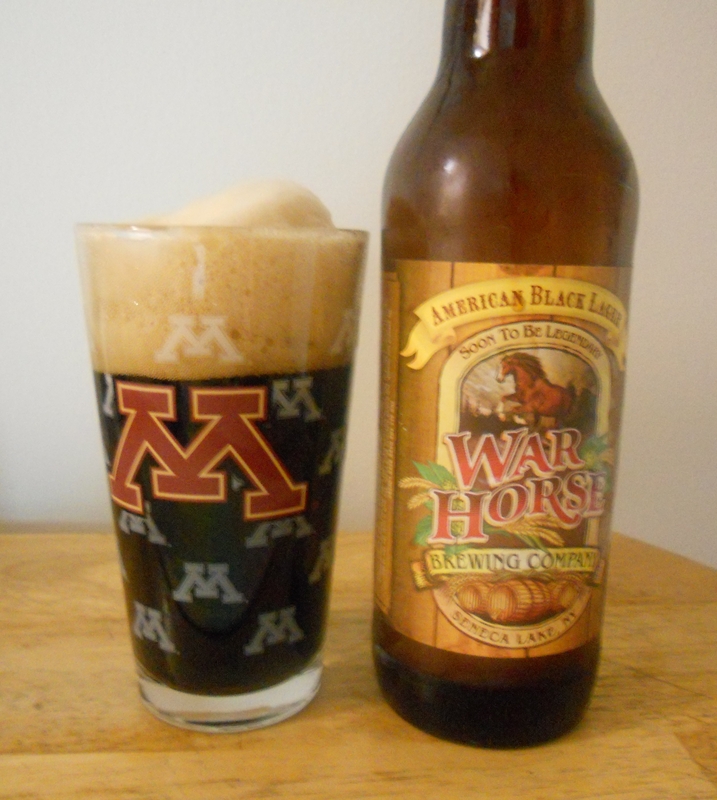 Characterized by being much less bitter than traditional stouts, but still thick and creamy. Definitely not a session beer. Overall Impression:This was a great beer. It was an excellent balance of sweet and roasted flavor, with a creamy, full body, but not too thick. I’m glad I didn’t wait any longer to try this–go pick some up. Now. Appearance: Beautiful dark brown color, lovely head retention. Smell: Espresso and malt aroma. Perfect for a stout. The sweetness doesn’t really come through until you taste the beer. Taste: Roasted espresso, decent bitterness, but with that overlying sweetness one expects from a milk stout.